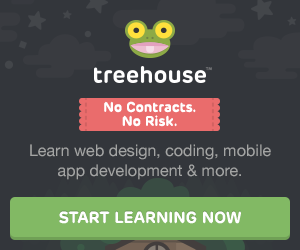 The Treehouse mission is to bring affordable Technology education to people everywhere, in order to help them achieve their dreams and change the world. Learn to build websites, create iPhone and Android apps, code with Ruby on Rails and PHP, or start a business. Learn from over 650 videos created by expert teachers on web design, coding, business, and much more. The Treehouse library is continually refreshed with the latest on web technology so you'll never fall behind. You'll earn badges as you journey through the extensive library of courses. These badges are an indicator of what skills you currently possess and are viewable by anyone (even recruiters from big companies!). Ready to start your learning adventure? Unlock your full potential with a world-class technology education!